Souvenirs don’t have to be keychains and shot glasses. Use a sharp eye to uncover the real local souvenirs in Virginia’s Blue Ridge. They’re right under your nose and make perfect gifts or special reminders of your trip through our mountains and towns. For a sense of place that can rest on a door frame, window sill, or shelf, pick up a Cats Meow collectible piece from Apple Barn II Gifts & Collectibles in Troutville. They’re the #1 Cats Meow retailer in the nation. At chocolatepaper in downtown Roanoke, the Roanoke Star comes in chocolate form. Take the tasty treat home with you, along with a “Roanoke Beer” glass to fill with your favorite beverage. The Gift Niche (pictured above) carries Tervis tumblers representative of Roanoke and environs, as well as collegiate gear. If you’re hung up on the “Star City,” you’ll find The Gift Niche in downtown Roanoke to be the right place to score something fun. Emerson Creek Pottery in Bedford offers beautifully hand-painted pottery, including an entire collection of “Summer Peaks,” depicting the Peaks of Otter. Add a lamp, tea cup, trivet, or flower pot to your home. 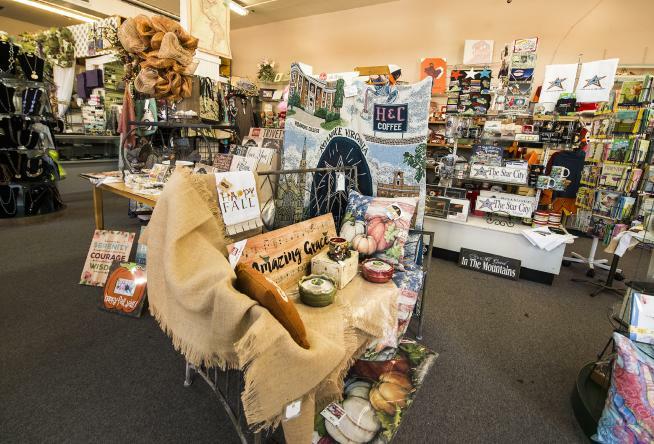 In Rocky Mount you can shop handmade gifts, art, and home décor at The Artisan Center along the Crooked Road. From photography and stained glass to quilts and wood turnings, you’ll find a beautiful souvenir. Two and a Half Sisters in Roanoke offers custom designs on a wide variety of products, but for our purposes, their Roanoke themed tees and art are the draw. Black Dog Salvage is an “as seen on TV” draw for many visiting Virginia’s Blue Ridge. Their rise to popularity is by virtue of the television series Salvage Dawgs. When you visit their marketplace, you’ll find plenty of antiques and regionally-salvaged materials, but you’ll also find re-purposed creations made in-house. Troutville’s Harris Hall of Antiques is not an “old stuff” dumping ground, but a carefully curated selection of fine pieces. There’s plenty of vintage advertising available at Harris Hall, too. Outdoor Trails in Daleville and Walkabout Outfitter (2 locations in Roanoke) are outfitters offering all the big outdoor apparel brands, plus their own branded items. Talk trails with the staff, get tips on local hikes, and take home an Outdoor Trails or Walkabout Outfitter hat or tee. For awesome swag and equipment for your next cycling adventure, head over to Downshift - Hand Crafted Bikes & Brews, where you&apos;re sure to find some great gear and meet other cycling & mountain biking enthusiasts who can tell you all about great rides in the region. Great weather calls for great wine!!! 4 awesome wines - all 4 are on 6 for $60!!! Get them while they last!! Now until 8! Eli’s Provisions in downtown Roanoke offers an array of Virginia tastes, including beverages, cheeses, jellies, and meats. Create a bag of treats for a loved one or to savor yourself. Allsports Cork & Keg is Salem’s go-to for a wide variety of beer, wine, and even cigars. Mix and match flavors crafted in Virginia’s Blue Ridge! Roanoke’s Wine Gourmet is another purveyor of Virginia wine and beer, as well as other rare and hard-to-find beverages from around the world. 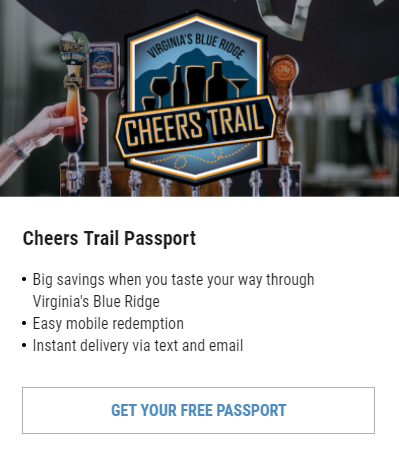 Also in Roanoke are Mr. Bill’s Wine Cellar and Barrel Chest Wine & Beer. Master Sommelier Mr. Bill and the knowledgeable staff of Barrel Chest all readily share their knowledge to enhance pairings and palates. Take home the tastes of Virginia’s Blue Ridge when you stop by one of our favorite general stores or markets. Heritage Family Market in Fincastle offers bulk dry goods, candies, and spices, as well as preserves, jams, jellies, and salsas. Don’t skip the freshly baked breads and pastries! Similarly, Boone’s Country Store in Boones Mill is a family-owned establishment offering fresh baked goods, eggs, vegetables, and a smattering of local wares by other purveyors. Known for their milk sold in glass jars, Homestead Creamery in Wirtz is a favorite place to get ice cream and egg nog … and chocolate milk … strawberry milk … cowpuccino milk … Don’t forget to pet the calves! The best thing about The General Store at Smith Mountain Lake in Moneta is the Made in Virginia selection, including SML arts and crafts. You’re sure to find something that tastes good and looks good, too. 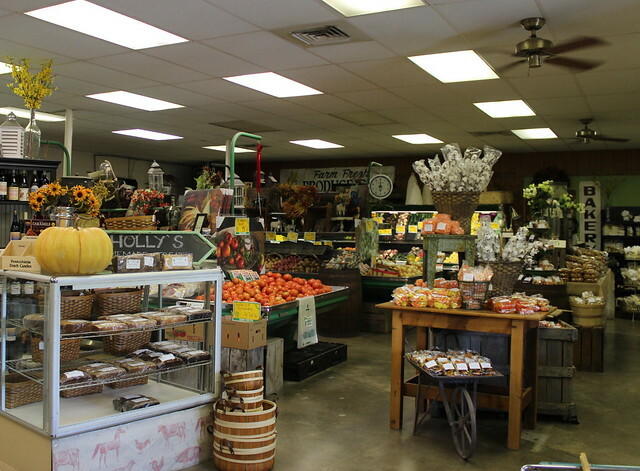 Daleville’s Ikenberry Orchards & Country Store has fresh-picked fruits and vegetables in the appropriate seasons and plenty of other fresh, local products year ‘round. You’ll find local apple butter, wine, beef, honey, and roasted coffee among them. 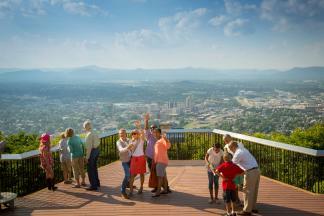 As you make your way through Roanoke visiting museums, a few are especially fun for their gift shops. For example, the Virginia Museum of Transportation, Mill Mountain Zoo and O. Winston Link Museum are great places to shop for kids. Toy trains and stuffed animals are always a hit. The Link Museum also offers reproductions of the famed black and white images you’ll find within the museum. Blue Ridge Institute & Farm Museum in Ferrum has a gift shop that would delight anyone who loves folk décor and nostalgia. Handmade wooden toys, walking sticks, copper bowls, ironworks, and much more are available. The Salem Museum & Historical Society’s shop offers books about Salem’s history and beautiful ornaments of historic buildings. We wish you happy shopping expeditions to find the perfect souvenir to treasure or savor! For more shopping inspiration, check out our Shopping Directory. You can also take a look at our list of local shops that sell Virginia is for Lovers merchandise.